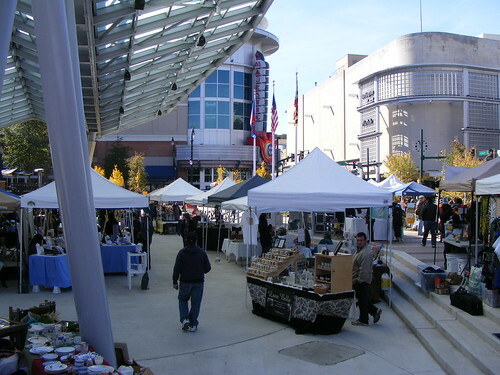 Fenton Street Market, shown last fall, may have to leave Veterans Plaza in downtown Silver Spring. Two years ago, East Silver Spring resident Hannah McCann saw an empty parking lot near her house and sought to make use of it with a flea market. Today, the weekly Fenton Street Market has dozens of vendors and a new home at Veterans Plaza. Yet the market's success may come to an end as Montgomery County wants to collect higher fees for using the plaza - as much as $35,000 a year, reports the Examiner. We have prided ourselves on being excellent tenants, using the space responsibly and leaving it better than we found it at the close of each market day. I live in this community, and I’m personally invested making our neighborhood shine. The Fenton Street Market has activated a formerly empty expanse of concrete in our downtown with a vibrant, community-based enterprise that stimulates the local economy (read the results of our 2011 economic impact study showing we bring more than $1.9M a year to downtown Silver Spring). And yet, it has been suggested to me by the county personnel charged with contracting the space that the community might benefit more from the Plaza being used as a putt-putt golf course next summer. Check out the market's website for more information, and watch this space for updates. Are we being punked? Which County Morons should I contact about this? The Fenton Street Market is an incredible marketing tool for Silver Spring. A putt-putt may bring in more money and more teens in the short run, but it doesn't market Silver Spring, and, frankly, could really hurt Silver Spring in the long run, especially with attracting people to live in the area (and pay those taxes the county wants so badly). The farmer's market and the Fenton Street Market have created one of the best markets in the entire DC region. That's incredible marketing for Silver Spring and the county. If county officials cannot see this they are idiots. I would use nicer language, but you have to really not be playing with a full deck to suggest that a putt-putt would be a better use.